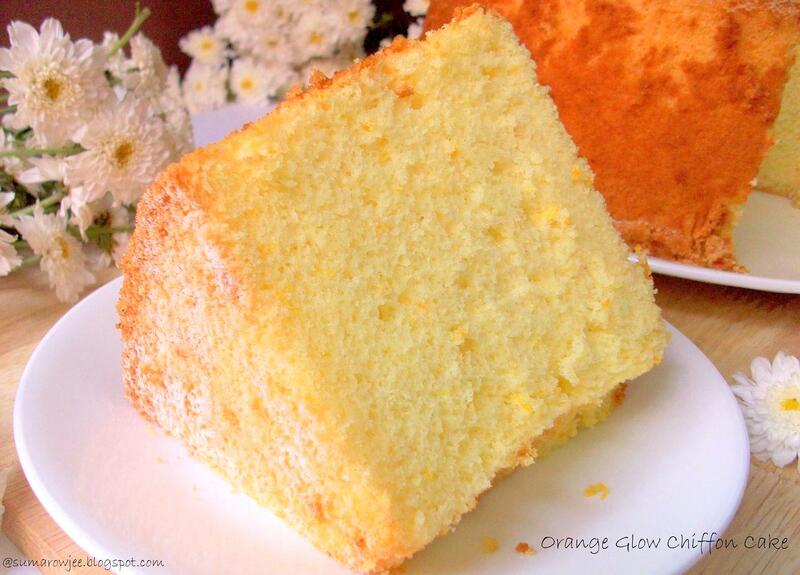 Moist, billowy, light as a feather is how Rose Beranbaum describes the Orange Glow Chiffon Cake in her book, The Cake Bible. Baked this delightful cake which is indeed is all of that, not to mention tasty, truly zesty and refreshing. 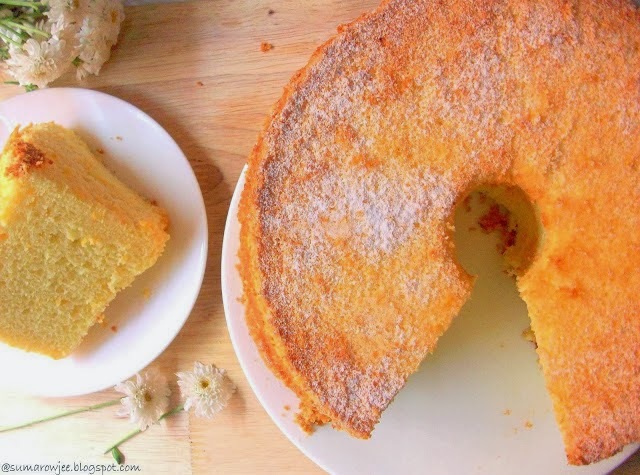 For those of us new to this cake, a chiffon cake is made with oil and more liquid as in juice or water, which ensures a moist cake, while a good number of egg whites whipped and folded in, gives it real light texture. 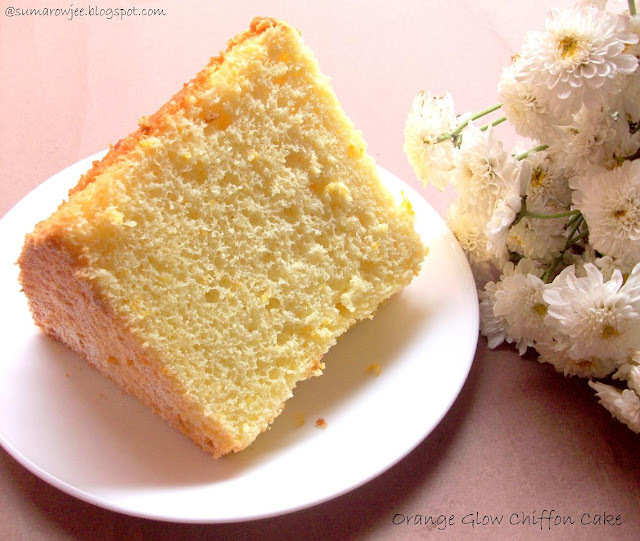 Chiffon cakes belong to the category of foam cakes which characteristically have a high proportion of eggs to flour. Biscuit, roulade, angel food cake, sponge, genoise etc are other cakes in this group. These cakes rely more on the whipped eggs for volume and lightness than on leavening agents like baking powder /soda etc..
Once baked, the cake in the pan is immediately inverted and cooled upside down suspended over a bottle or with the help of the 'feet' of the pan. If cooled right side up as in other cakes, the cake will collapse under its down weight, resulting in a dense, unappealing cake. Some tube pans have 'feet', which help the air circulate underneath when the pan is inverted, aiding complete cooling and perfect texture. With oranges everywhere now, the citrus-lover that I am, I plan to make the most of the season. My brand new tube-pan is reason enough for me to start with an orange chiffon cake, something I have longed to try. I have technically baked a chiffon cake a few years ago, but not in a tube pan as I did not own one. This cake is quite easy to bake, as the dry ingredients, oil, juice and egg yolks are just beaten together and finally the whipped egg whites are folded in towards the end. The success of the cake depends hugely on whipping the egg whites to the right consistency and folding it into the batter, without any loss of air. This done, you will turn out one of the lightest textured cakes, which will delight you as a baker and leave others wondering as to how that texture could have been attained. And you take even more pleasure in gloating that this is not a butter laden, cholesterol laden cake, quite the other way, a cake with low cholesterol per serving! A large balloon whisk, or a large silicon spatula or a slotted skimmer for folding in the egg whites. A sturdy and heavy, narrow necked glass bottle to invert the cake on. 2 large mixing bowls will be of great help in mixing in without overworking the batter. A good zester will make zesting the oranges a breeze. Method: Pre-heat oven to 160 degrees C / 325 F. Do not grease or flour the tube pan. In a large, deep mixing bowl, combine the sifted cake flour ( OR APF plus cornflour) baking powder all but 2 tablespoons sugar and salt. You will be adding the whipped egg whites to this bowl so it has to be large enough to mix in. Set aside. Measure the rest of the ingredients and set aside. Have a squeaky clean large, dry bowl and really clean beaters ready to whip the whites. If there is any trace of grease in either the bowl or beaters, your whites will not whip well. If there is any yolk in the whites, use an egg shell to take it out, works really well. Weigh the egg whites and the yolks, whites to be weighed first. You don't want to wash the weighing bowl in between again, more importantly take any chance with grease after the careful exercise! Yes, we all know, yolks are grease. If you will be using the same beaters for beating the rest of the cake batter, its better to first beat the egg whites and set aside. Hmm.. we have to live with this way of working till we get our stand mixers with different bowls and beaters ..:)). Now to beat the egg whites, start with your hand mixer on low speed. When it starts foaming well, add the cream of tartar. If you add it beforehand, the whites will not foam. Once you add the cream of tartar or lemon juice, continue to beat gradually increasing the speed to medium high. When the beater marks show distinctly and soft peaks form, add the 2 tablespoons of sugar you have reserved. You could add the sugar beforehand, but whites whip faster to soft peaks without the sugar. Continue beating for a minute more till the whites form stiff peaks. To check, stop your mixer, slowly lift the beaters from the whites, you should be able to see peaks which stand straight. If they droop right away and fall back, you have to beat a little more. Be careful here, stop and check after a minute or so, as you do not want to beat the egg whites till they dry out. If they dry out, it will not easy to incorporate into the batter and your cake will not be light. Once the whites are whipped to the right consistency, keep the bowl aside. Wash and dry the beaters. Back to the large bowl with the dry ingredients. Beat these for 1 minute to mix and aerate the mixture. Make a well in the center, add the orange juice, yolks, oil, orange zest and vanilla. Beat for 1 minute or till smooth. Do not over beat. Now using a balloon whisk or slotted skimmer or large spatula, fold in 1/3 of the egg whites into the flour mixture. Mix to lighten the batter. Then tip in the rest. Fold in quickly, gently, but thoroughly. I used a large slotted skimmer for this. If using a balloon whisk, shake out the batter periodically. The batter is neither thick nor thin. Remember, you must add the whipped whites to the batter and not add the batter to the egg whites, the whipped whites will then deflate. Pour the batter into the pan. The batter will come to 1 inch from the top. Run a sharp knife or metal spatula through the batter to prevent air pockets. Wipe away any batter from the tube or the sides of the pan. If you do not, this little bit of batter will burn. I don't know about you, but I prefer my cake smelling zesty rather than burnt! Bake for 55 minutes or till a cake tester inserted in the center comes out clean and the cake springs back lightly when pressed in the center. Mine took around 63 minutes. It was domed in the oven, I could not longer see the tube, was worried the top may touch the inner top of the microwave. Frowning me. Did I do something wrong? But it deflated slightly once out of the oven. The tube was showing now, the height akin to what I remember seeing in the videos! Relieved me! While your cake is baking, have your bottle ready. 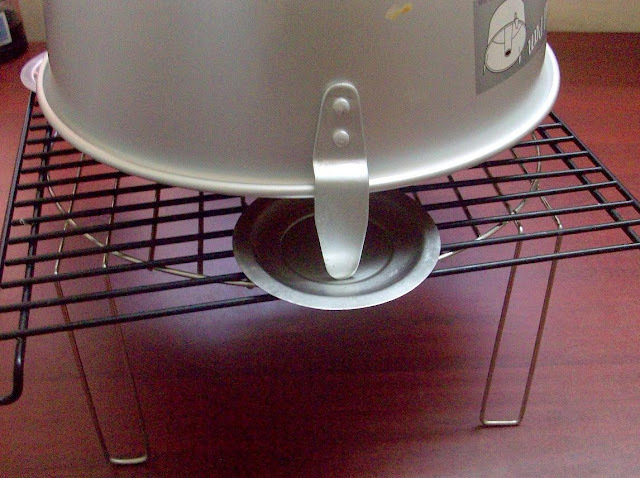 I did not find a suitable one, so I had to some engineering to 'build' a make-do high rack for the pan with feet! Even if using a pan with feet, according to Rose, the height it provides off the counter is not enough for the cake to cool sufficiently. The point is to suspend the cake well over the counter to allow the cake to cool completely. Don't laugh, but this is what I did .Want to show you just in case you don't find a suitable bottle either. If you have multiple suitable bottles, save one for me please, more chiffon cakes baking in my kitchen! Once baked, stick the neck of the bottle into the tube of the pan and then invert. I did not do it, but imagine it must be tricky with a hot pan. Even otherwise, you absolutely need thick towels or mittens to handle the large hot pan. The cake will take 1 1/2 hours to cool. You bet, this is one test of patience !! After 1 1/2 hours, keep your serving platter nearby, loosen the sides of the cake with a long metal spatula or a knife. Run it along the sides of the core tube as well. For the sides to remain attractive, press the spatula or knife against the sides of the pan and avoid any up and down motion. Place the serving plate on top of the pan, put the plate on the table and invert the cake. I placed it slightly off-center, but did not want to risk breaking the cake, so let it be. The sides did not release real clean, but was happy to have the cake in one piece. I used a knife to gently separate the plate with the tube from the cake. Hold the cake gently with one hand and cut with a serrated knife. This cake can be stored at room temperature for 3 days, 10 days in the refrigerator, 2 months in the freezer. Rose says, there is no way you can dry this cake out, its great even eaten straight out of the freezer ! Serve at room temperature or lightly chilled. While you are here, don't miss this video of Rose Beranbaum baking the Orange Glow Chiffon cake, which was filmed in 1988!! I found the video very helpful, pay special attention to whipping of the whites and the way she folds in the whipped whites into the batter and the size of the skimmer suitable. Am glad I watched this, even more glad I got the cake right!! Notes: To repeat, whipping the egg whites to the right stage and folding it into batter without any loss of air is critical to the lightest texture. Sugar: Use best superfine sugar. Since I did not have super-fine sugar, I have measured the sugar first, then processed it in the mixer till almost fine. Fine sugar helps get better texture. Flour: 1 cup of sifted cake flour equals 84 grams of APF plus 15 grams of cornflour. Source Joy Of Baking. So I have used a total of 190 grams of APF plus 34 grams of cornflour in all to make 2 1/4 cup of sifted cake flour. Cream of tartar: This is very helpful to help avoiding over whipping egg whites. According to Rose, its virtually impossible to over beat whites when you add cream of tartar. But use it in the right quantity as specified. More can cause the whites to not whip well. I have used lemon juice in equal quantity as cream of tartar was out of stock at my grocers. Slotted Skimmer : This is the most easily available one for us to use for folding in the whites. An almost industrial sized one, the kind normally used for deep frying. I got myself a new one, but found it quite heavy and difficult to use because of the weight. Get a lighter one if you can find for more ease. Orange Zest : If you do not have a zester, scrape the bitter pith from the orange peel and process the peel with sugar till fine as Rose does in the video. This is a very large, just about sweet, really spongy and light cake, quite unlike any cake I have baked. Serves 16, so share some (just some;-) if you can and save the rest, in the fridge or freezer. I am now tempted to try more variations of the wonderfully light textured cake...In my humble opinion, a must try - even if you have to buy, beg or borrow a tube-pan! 'Dessert' is the family middle name! My baking life would otherwise have been unimaginably miserable, considering my ancient affair with desserts and sweets. Kids and hubby more often than not, ask if there is dessert after a meal, knowing fully well, the answer will more often than not, be a sad 'No'. I convince myself that a spoon of sweet saunf or supari is my chocolate mousse after most meals. We would probably eat dessert after every meal if our health and the nefarious weighing-scales would permit us to...Sigh!! My son growing chubbier and yours truly growing rounder by the day keep reminding me to make desserts less frequently, treat them as once-a-while indulgences. How I hate the villains in my sweet-somethings love story! Did I mention that hubby is a big time lover of coconut ? Add a generous lot of coconut to his chutney to go with idli-dosa and it will make his weekend. Make fantastic lemon-rice (a dish he can eat everyday, no exaggeration! ), skimp on the coconut and his joy will be instantly halved! Another love is chocolate. He can eat a tiny meal of these for dessert. Whenever my sister-in-law asks him what she could get for him from the US, he invariably asks for only chocolates - special preference to those with nuts and coconut. The answer has been the same since the last twenty years or so, so she has now stopped asking him. Bottom line - He loves these two things! On an entirely different note, funny and weird as it sounds, did I ever tell you that preparing for travel, kind of stresses a not-very-organized me out? I really do admire people who very effortlessly travel every now and then with kids in tow. Specially if its for weddings and the kind. Coordinating sarees and jewellery for each of the numerous functions is not something I am very adept at. And now with my daughter watching and aping me , nothing less will do for her either, so double the effort! Traveling with kids being an entirely different ballgame, there must be snacks, the quintessential medical kit, 'at-least coloring books and a ball' among other things in the travel bag. Clear the fridge, make sure the kids' assignments are completed before we leave, hand over my precious pot of basil to the neighbor. To top it all, things need to be in place to rush the kids to school in an hour after we come back. In short, I have a serpentine, boring of list of things needed to be done - apart from the mundane chores needed for survival - Aaahhh! A stress-busting, very welcome, short break to bake something seriously quick for hubby to munch on while he watches Everybody Loves Raymond? 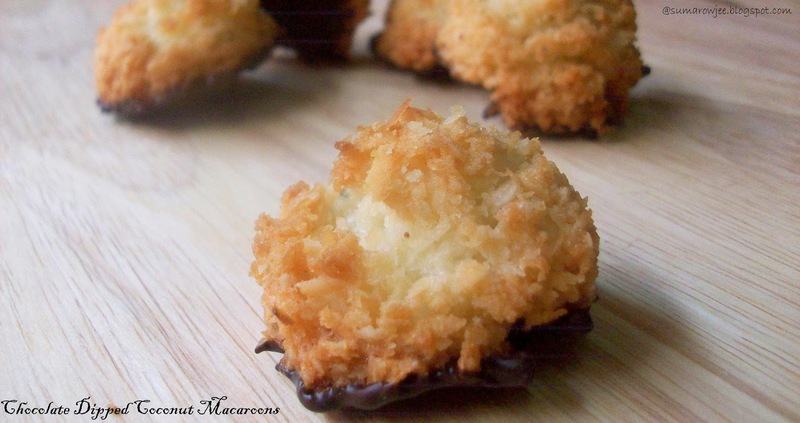 Seriously quick coconut macaroons? Why not? The gaping suitcases waiting to be packed can wait for another hour, absolutely! Some macaroons are made with whipped egg whites, almond meal etc, piped and baked. These are the ones apparently difficult to master, the kind people research and write tutorials about. (I am yet to muster up courage to try these). Some kinds need egg-whites to be cooked on the stove-top with coconut and sugar, the mixture chilled and then baked, so not really difficult, but needs pre-planning . 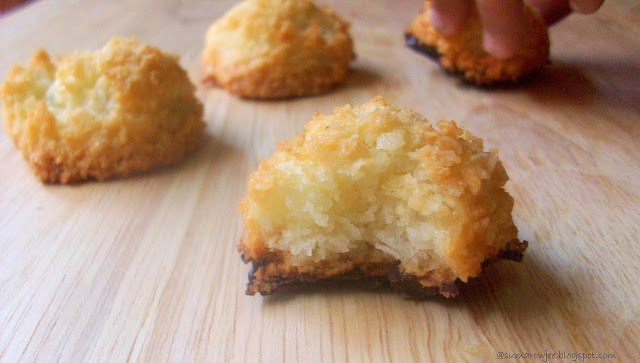 The macaroons here are made by simply whisking together whole eggs, shredded coconut, sugar and vanilla, then baked. 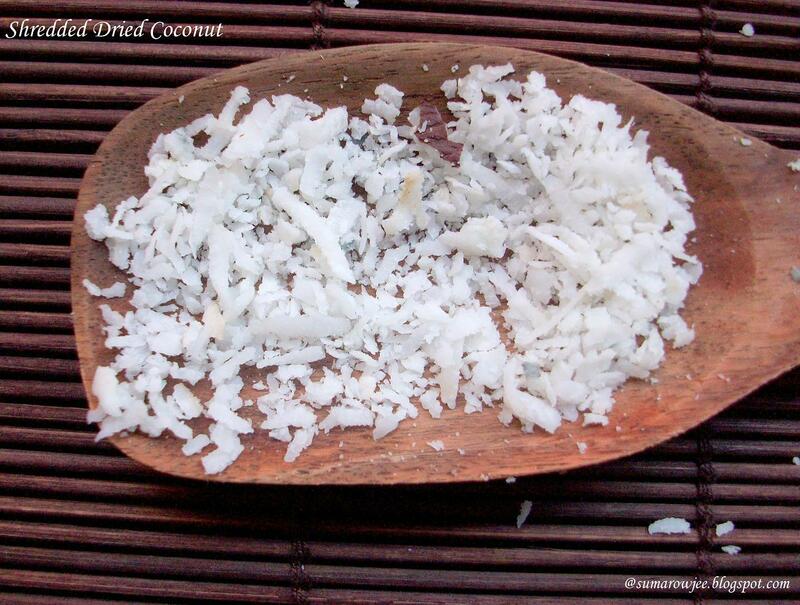 If you have shredded coconut on hand, its as easy and quick as saying 1-2-3! Crispy on the outside and chewy within, the bottoms dipped in chocolate - what's not to taste good? 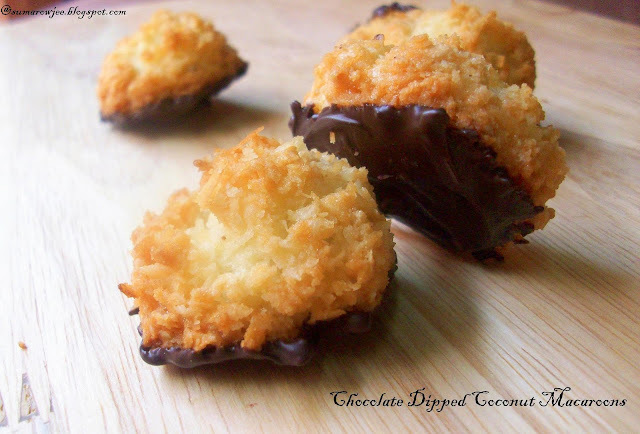 If you love the coconut and chocolate tango, this is a must try! Recipe adapted from Joy Of Baking, I have halved the recipe as I wanted to finish baking quickly. Plus continuously baking in multiple small batches is just not me! I have used peeled, grated dried coconut (copra). Have used a potato peeler to peel the dried coconut, slightly tricky to do this, so be careful. If you get ready shredded coconut, you could try using that. If I am not wrong, dessicated coconut, being much finer can't be substituted for shredded coconut and probably not suitable for this recipe. In my opinion, using the right amount of the right kind of coconut is really important in this recipe. Procedure: Preheat oven to 180 degrees C / 350 degrees F and line your baking tin / tray with parchment paper. In a medium sized stainless steel bowl, whisk the egg until well beaten, about a minute with the whisk. Stir in the sugar, salt (if using), and vanilla extract. Finally, stir in the coconut, making sure that all the coconut is completely moistened. You may feel that the coconut quantity is more compared to the egg, but it will be fine. You will have a moist coconut mixture, quite thick, you almost can't see the beaten egg. Place small mounds (about 1 tablespoon) of the batter on the parchment-lined baking sheet, spacing them well apart. These did not spread a lot. Bake for about 15 to 20 minutes or until golden brown. I baked mine for 22 minutes. Do a small test batch if you wish. Remove from oven and let cool on the baking sheet for about 10 minutes and then place on a wire rack to cool. They will crisp and harden a little more as they cool. When they are all almost cool, melt chocolate, cool. Dip the bottoms of the macaroons in the melted chocolate and place the macaroons, chocolate side up, on a tray. The chocolate will set in a few minutes. Stephanie says, refrigerate the cookies for about one hour, or until the chocolate hardens. I did not do this as I was not sure if they would stay crisp. You are supposed to store them in the refrigerator. But since it was a small batch we did not have enough (left :) to put in the fridge. This made about 20 (plus a few I think, not very sure, tasting-testing made me lose count, naturally!) small macaroons. Just about sweet, with slightly crispy exteriors, chewy insides and some chocolate to tease you just enough to reach out for the next macaroon. We loved them! Hubby was immensely pleased to eat these when he came back from work. But, intentions however noble, you will agree, remain mere intentions quite often. Only 2 of these remained for him to eat while he watched the Raymonds :). This quick and easy recipe goes on my list of keepers and I am surely baking these again! Please Note : I have first measured by lightly spooning shredded coconut into the cup (not packed them), measuring 1 1/2 cups, then weighed, this was 110 grams. This worked fine for me, so I shall stick with this. The original recipe has 300 grams of sweetened shredded coconut. 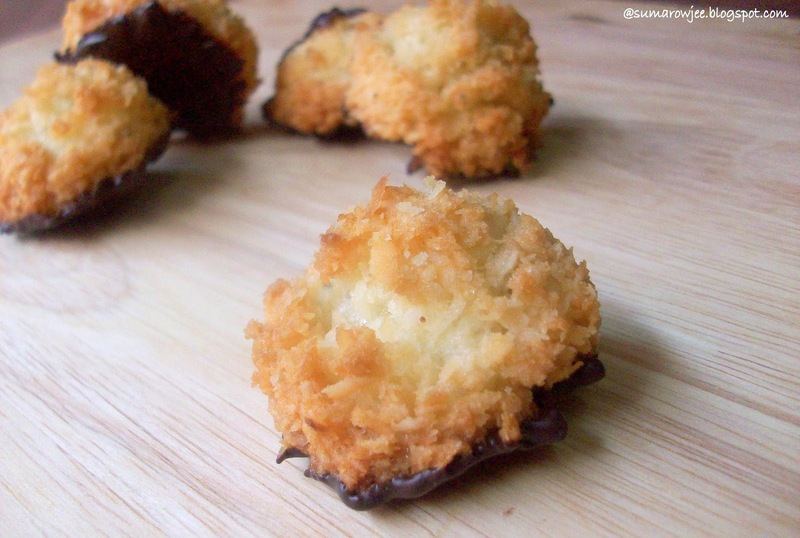 Looking for eggless coconut macaroons? Check this. Taking another walk down the memory lane, we were brought up in a small town near the famous city of ruins - Hampi, in North Karnataka. My great-grandfather was instrumental in forming a committee in honor of the famous saint-singer-composer Shree Purandharadasa. The tradition of being part of organizing religious events and music festivals on a regular basis has been handed down from generation to generation in the family - carried on till date. For most of similar events, there are committees that manage the functions and other activities like pujas, Aaradhane (anniversaries of saints), music festivals etc . Some of the committees are traditionally well funded, some well funded by members, some not, public contributions and things keep them going. As a kid, I remember us eating a few times at these functions at temples and Mutts (religious establishments usually with a seer heading them), where the number of people who are fed during these events are by the hundreds. Most of us are no strangers to these kinds of kinds of mass gatherings where the food is prepared in gigantic quantities, by dozens of people who seemingly have boundless energy. Kilos of rice and chopped vegetables, gallons of rasam and sambar are cooked over raging wood fire. Preparations begin since the dark hours of the day in order to feed crowd in the noon - more often than not, going on till evening. The food thus cooked on wood fire, has a distinct aroma of smoke and eating this meal on a plantain leaf adds to it. Many a times, the menu also includes some dishes which require lesser effort and time, not to mention cost and the feeding capacity quotient. You got to feed the sea of people and serve in batches and batches! One of these dishes commonly made is something called as Kayyi Chutney which literally translates to 'hand-chutney' meaning a chutney which doesn't need to be ground. Its made simply by sauteing green chillies, sometimes greens, coriander and hing, then coarsely crushing them by hand in a mixture of yogurt, gram flour, salt. The mandatory tempering goes into it and there you have a really quick, tasty accompaniment to rice. Unexpected shortage of rasam or sambar and kayyi chutney is dished up to quickly feed the anticipating hundreds. This is a chutney made in a number of households too, when you feel lazy and need something quick to go with rice while its cooking. Or when you have an unexpected guest and you want to add another dish to the rest of the meal. At home kitchens, the green-chilli mixture is normally ground to a coarse paste in the mixer and mixed in fresh yogurt and gram flour. But be warned, this is quite spicy, no, very spicy and doesn't have that wow factor if it isn't spicy enough. If you like your food fiery, you will love this one and make this part of your regular menu. Procedure: Stem and wash the chillies, pat them dry. Slit them vertically and cut into two parts. If you use them whole, they will pop in the hot oil and may cause injury. Heat the oil in a frying pan, add the chillies. When they blister and change color, they will also soften enough for you to crush them with your hand if you so wish. Take them out and place on a plate. Now add the coriander leaves and hing, saute for just a few seconds till the leaves wither. Remove on to the plate. Turn off the heat. You will be using the remaining oil for the tempering in the same pan. Allow the chilies and coriander to cool. Crush this by hand, this will give you chunks of chilly in the chutney. Or grind to a coarse paste in the smallest jar of your mixer. 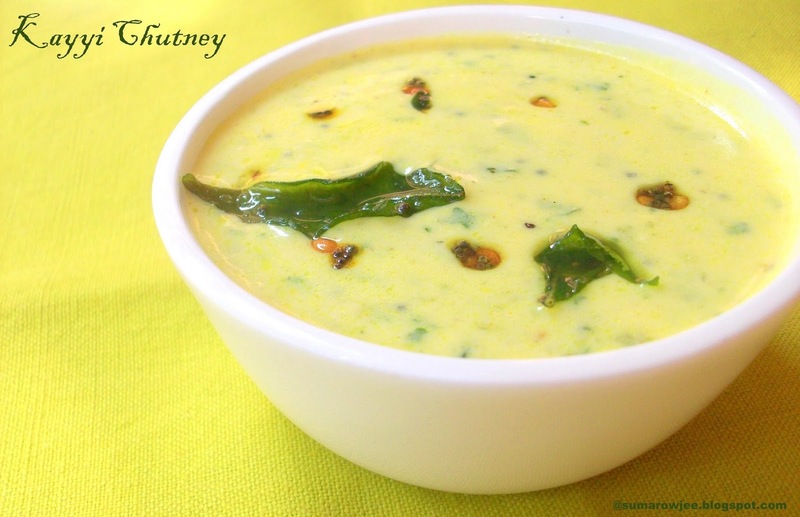 Whisk the yogurt, salt to taste and gram flour in a small bowl. make sure there are no lumps of flour. Add the crushed /ground green chilli paste. Heat the remaining oil, add the mustard seeds, when they splutter, add the urad dal and allow it to turn golden. Add the curry leaves, hing, turmeric, saute for a few seconds till the curry leaves turn crisp. Turn off the heat. Add the tempering to the yogurt mixture and mix. Serve with hot steamed rice and a spoon of oil. Keep any leftovers refrigerated or it will turn sour. Please note : The above quantity makes about a cup which is enough to serve 3-4 people. 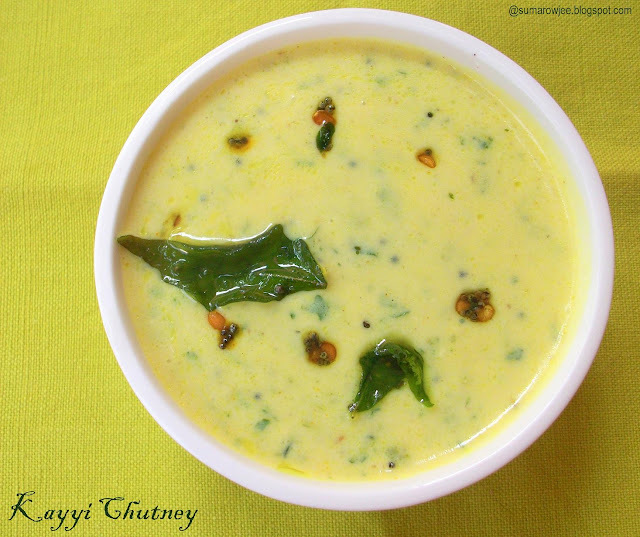 You can't eat this fiery chutney like sambar you see! The chilli will not be soft enough to crush with your hands if there isn't enough hot oil to dunk them in. Don't skimp on the oil, even if you chose to grind in a mixie. 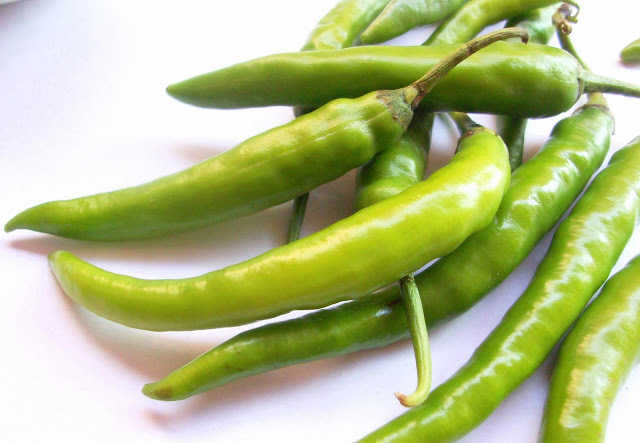 You could use slightly less number of chillies, but too little will make the dish bland and tasteless. I could eat kayyi chutney and rice as a meal in itself. Given that I am the only person at home who feasts on this, I often make, store in the refrigerator for 2 days. Custard for a lot of us here, conjures up an image of a yellow box of instant mix, occupying an almost permanent place in the refrigerator and on the grocery list. We have grown up eating this dessert, most often with fresh fruit. A good number of times, this dessert makes an appearance post festivals when you have fruit raining all over the place. Or as one real quick and easy life-saver dessert for unexpected guests. For folks like me, the 'real' custard made with milk and eggs is something very new. I am not much of a custard (made with powder) person and hardly ever make it out of choice. Was curious to know what a home-made custard tastes like.Tried it and we absolutely loved the creamy sauce with the barely perceptible crunch of the vanilla bean. So much better and delicious than the custard made with custard powder mix! Received a stash of plump and shiny beans from Deeba , am truly humbled and don't really know what to say except a heartfelt 'Thanks a ton!' for that generosity...I am now spolit for the quality and going to be looking out for similar ones. What difference quality does to the end product! Compiled with reference to The Cake Bible, Baking 911 and Joy Of Baking. 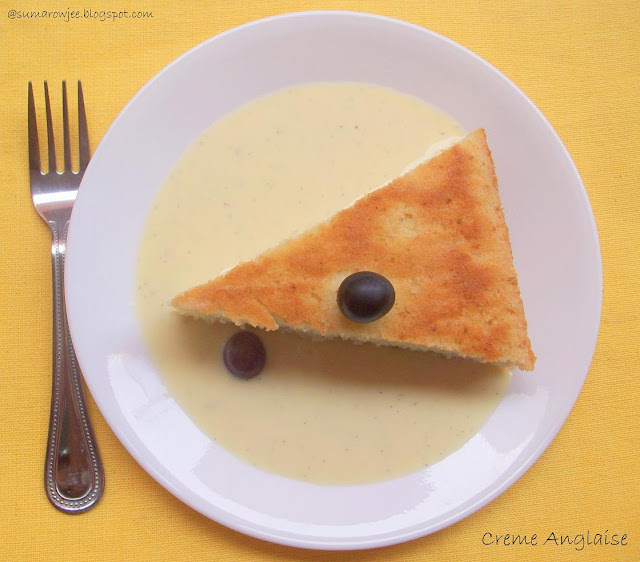 Creme Anglaise or English Custard Sauce or home-made custard sauce is basically milk, egg yolks and sugar cooked on the stove top (sometimes over a pan of simmering water) with flavoring optionally added to it. Whole milk forms an extremely important part of this sauce, the egg yolks add to the richness and the characteristic yellowish color. The end result is a smooth and creamy, delicious sauce which can be served warm or cold with fresh fruit or used as a base for other desserts. This is a 'cooked' or 'stirred' custard as it is cooked on a stovetop and differs from a 'baked' custard which contains whole eggs and baked in a water bath. Custard and its variations are quite a few. 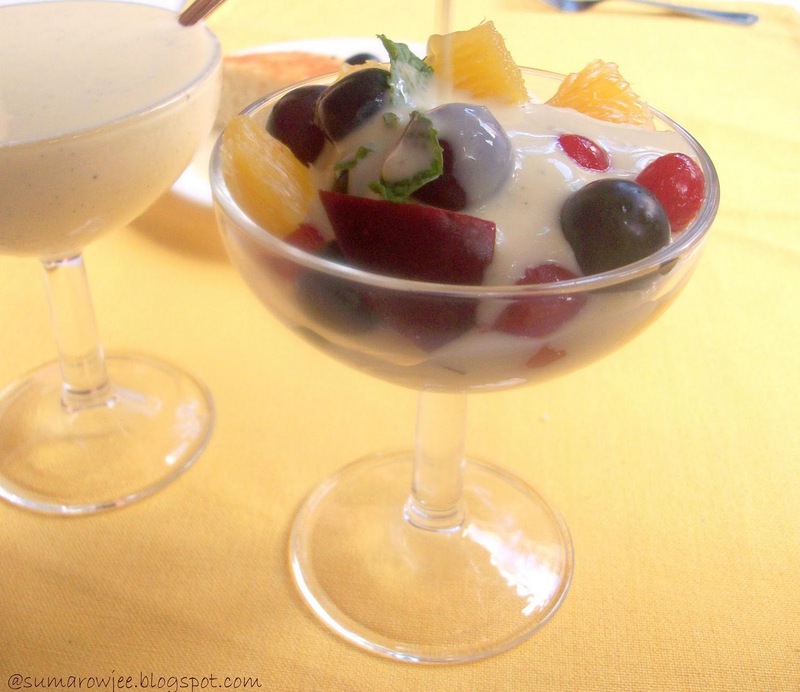 Bavarian cream is Creme Anglaise which contains whipped cream and is molded with gelatin added to it. 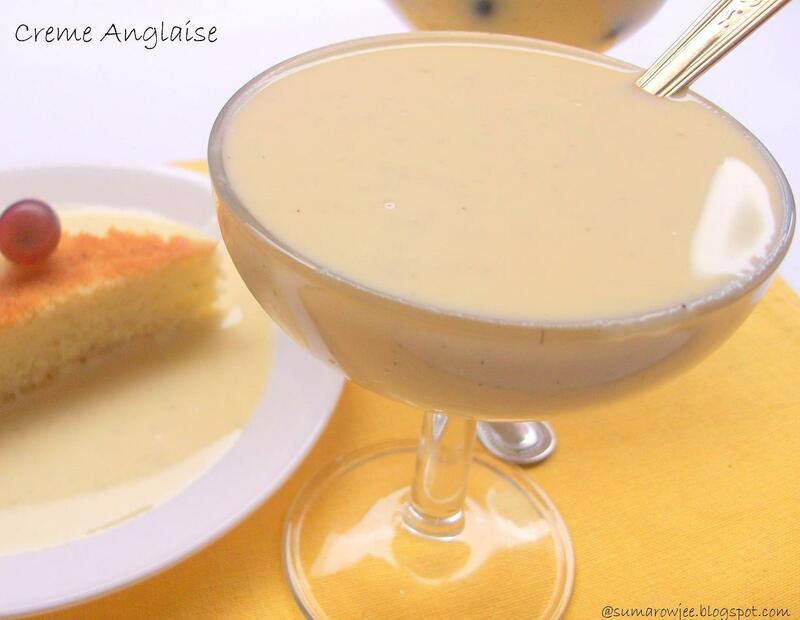 You could make Creme Anglaise with part heavy cream and make a rich ice cream out of it. When you use cornstarch to thicken the custard sauce, it becomes pastry cream and can be used as a filling for pies, eclairs and cakes. Creme Caramel is custard (with whole eggs) baked. Creme Brulee is rich custard baked and then topped with a crackly layer of caramelized sugar. 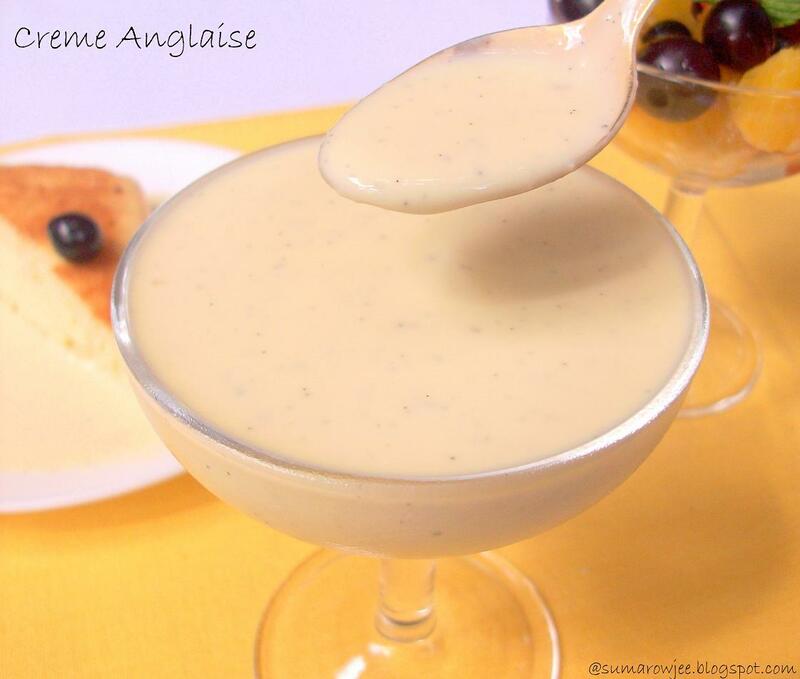 Creme Anglaise can be of varying consistency and richness, but its not meant to be very thick or very sweet, its mildly sweet and always pourable. The standard proportion is 2-3 egg yolks and 2-3 tablespoons sugar for every cup of milk. You could use vanilla beans or grated orange zest or liqueur to flavor the sauce. In The Cake Bible, Rose Beranbaum makes versions with ground coffee, pistachio and praline paste too. Important :Cooking the custard till the right point is critical here. 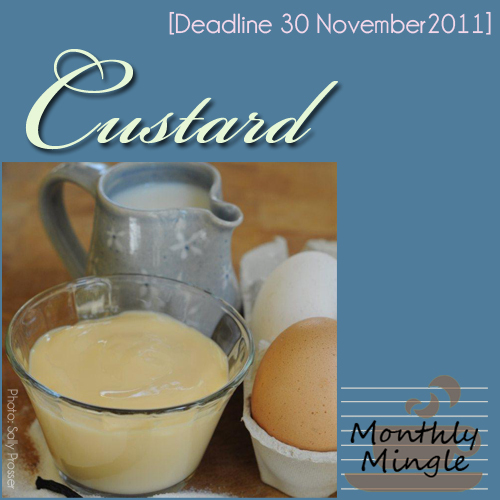 An undercooked custard is not safe to eat, overcook and the sauce may curdle. And the difference between cooked and curdled can be a few seconds. So do get all the ingredients and paraphernalia in place before you begin. You will need: A large bowl of ice. A largish stable bowl with a wide base (so that the bowl doesn't spin as you whisk) A smaller bowl placed in the ice-bath with a strainer suspended over it. A whisk, spatula, a wide spoon and a heavy saucepan. Helpful to have an instant read thermometer. Your mixer with the largest jar - a clean one, ready to use! Procedure: Suspend a large, fine strainer over a bowl, place it over a larger bowl filled with ice. (this helps arrest the cooking process when you strain the sauce into the bowl). Whisk the egg yolks and sugar (and salt) together in wide-base bowl. Keep aside. Do not leave this sitting for too long as a film will develop over the yolks. Take the milk in a heavy saucepan, scrape the vanilla bean caviar into it. Heat the milk and vanilla bean to the boiling point. Turn off the heat. Take 1/4 cup of milk and very slowly dribble it into the yolk and sugar mixture, whisking all the while. Slowly dribble another 1/4 cup, while whisking continuously. Dribble in all the milk gradually. Let the bean remain in it. Pour the mixture back into the saucepan. Cook the custard on low heat (to be safe), stirring constantly. Steam will begin to appear and the mixture will thicken. The sauce will leave a well defined track on the back of a spoon when you run a finger across. This will be at the boiling point ( between 170 degree F and 180 degree F). This happened only nearing 180 F for me. The time will depend on the heat you are giving. It took me about 3 minutes on medium heat. The point at which you will take the saucepan off the heat is at the point when the sauce leaves a trail on the back of the spoon without the sauce running down the trail . At this point, immediately take the saucepan off the heat and strain it into the bowl set over the ice bath. Keep stirring constantly, till it cools. The sauce will be thick at this stage and will thicken further slightly when chilled. Refrigerate when it comes to room temperature. When the sauce cools, stir in the vanilla extract or liqueur if using. You could use the sauce right away or chill and use. If using the sauce later, let the bean remain in the sauce till you serve. You can store this upto 5 days refrigerated, 3 months frozen according to the Cake Bible. Pooled around a slice of cake... And just as is, chilled! Straining is important even if there is no curdling as it will give you a smoother sauce. Making this custard is really easy and quick and the result is delicious. Very eggy? Surprisingly no. I am wary of eggy smelling dishes and this one was surprisingly not smelling very eggy in spite of the 6 yolks I used. Try it out for yourself, its worth trying out even if you are egg-phobic! As for me, I am going to be making this again and again! 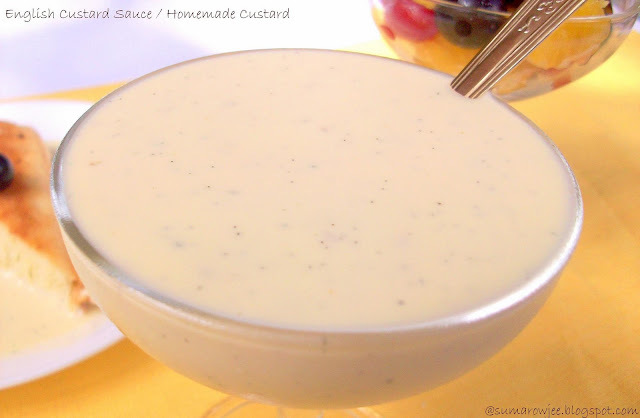 Get comfortable making this custard sauce and you can dish up a lot more! After all my talk about yeast and yeast bread basics, I thought it would not be completely amiss to tempt you with another super-easy no-knead bread recipe. This time around for soft cinnamon rolls. Because, suddenly I realized, cinnamon, chocolate and other sinful kinds of sweet no-knead breads are missing from my list. 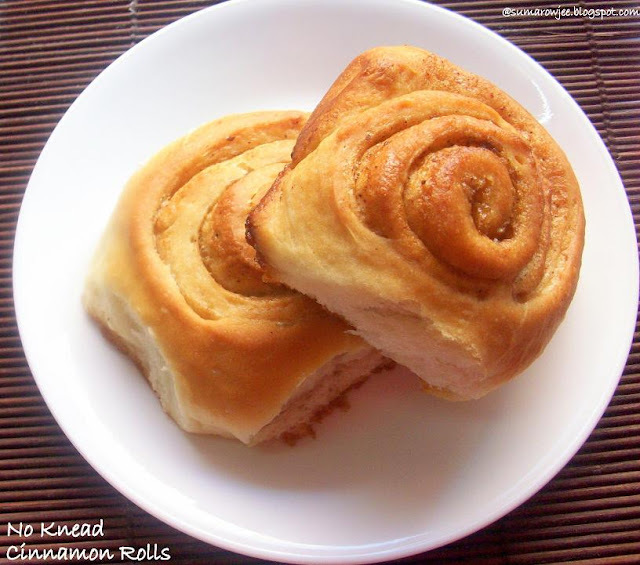 Hopefully, imagining the aroma of cinnamon scented yeasted rolls wafting in your home will make you give it a try? May I also mention that this recipe is from The Pioneer Woman, Ree Drummond. I first saw this recipe on Happy Home Baking and was immediately interested. 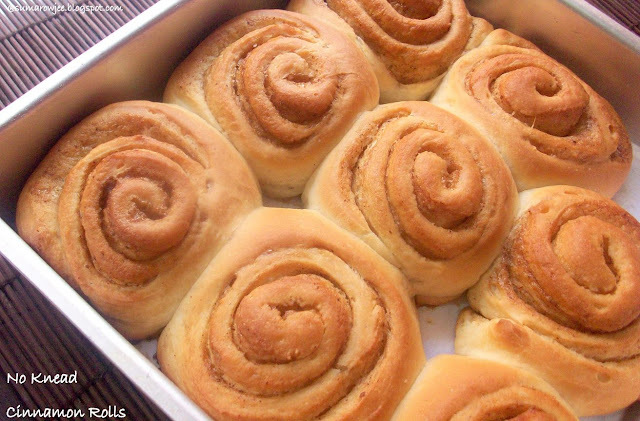 Tough not to be when the recipe goes by the name Magical Rolls. 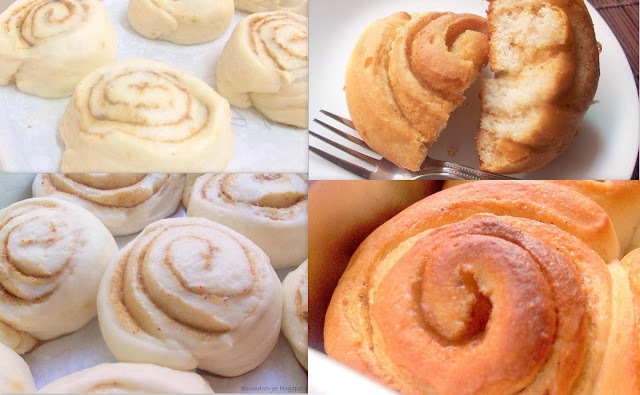 Apart from being seriously good, they are easy-peasy, no knead, non-butter laden, sweet yeasted cinnamon rolls, with surprise ingredients, baking powder and soda to boot. Tough not to feel tempted to try. Ree's recipe makes a whopping 7 pans full of cinnamon rolls, as they are meant to be given away. Since I wanted a small batch, I have followed the quartered recipe in Happy Home Baking. But you could very surely make double of the recipe given below as the dough can be made and refrigerated for a day or two. 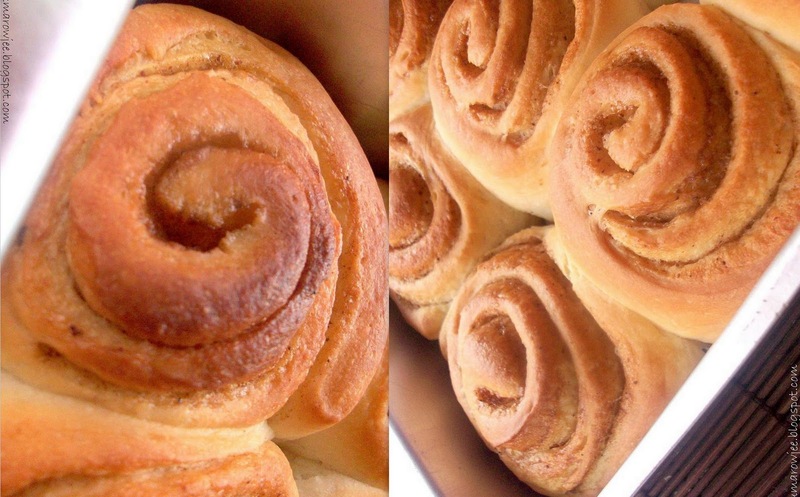 Fresh rolls from the oven without a lot of effort, many of us won't mind a lot I guess? The dough is made with first heating milk, oil and sugar in a saucepan, left to cool till its lukewarm, then add the yeast and flour. Let it double, add some more flour, baking powder and soda, mix in. Dump the dough in a box, leave it for an overnight slow rise in the fridge for more flavor. If you are like me, you will sleep better knowing there is dough rising in the fridge. If you are like me, when the alarm goes off at 5.30, you will first think of the dough in the fridge, run and check. Beautiful! Its risen so well, more than double - almost!. Yay! You now can't wait for hubby and kids to take off to work and school so that you can bake!!! At last, time to shape and let the dough rest for sometime and then bake. For the filling: Alter the quantities to suit your taste. We do not like a whole lot of cinnamon or sugar, so I have used less. Procedure: First things first - Mise en place. Measure out all your ingredients and keep them ready. Mix milk, sugar and vegetable oil in a pan, preferably one big enough to mix the dough in too, less cleanup later. Scald (heat until just before boiling) the mixture. Leave to cool for 45mins to an hour. The milk mixture must be lukewarm at the end of this period. In case you leave it for longer, just warm it till its lukewarm. Then add 260 grams of flour to the mixture. Stir with a spatula, you will get a batter that's quite sticky. Cover and let the batter sit for 1 hour or till double. Mine took an hour. It may take lesser time if its warmer. Mix the 33 grams (1/4 cup) flour, baking powder, baking soda and salt. Add this to the flour mixture in the pan. Mix till everything comes together. It will still be very sticky. You could make the rolls straightway or refrigerate the dough. I would not attempt handling the sticky mass at this point of time. Chilling makes it easier to handle. So transfer it to a large box, close the lid loosely. The box must be large enough to allow the dough to more than double and still have some space left over. You don't want a mess in your fridge when you wake up! Divide dough into half, refrigerate and use separately if you can bake only one small tray at a time. 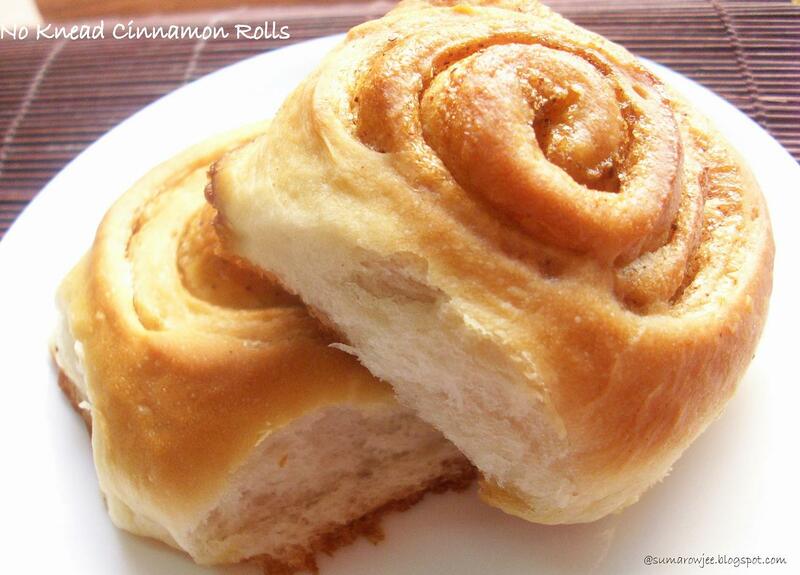 When ready to make the rolls, before you even take the dough out of the fridge, get these things ready. Line your baking tin with parchment and grease the sides. I used a 9'' square tin and a smaller tin as I baked simultaneously in the microwave and OTG. You could also bake two separate batches, taking out only portion of the dough at a time. Mix ground cinnamon and sugar in a small bowl. Have your silicon brush, soft butter, rolling pin, sharp knife or dough scraper, extra flour ready. Flour your work surface with enough flour. This being a sticky dough, it would otherwise be impossible to roll out. If you take the dough out first and then spend time on this, your dough will lose the firmness and will not be as easy to handle. Roll out the dough into a rectangular shape. I rolled it out into a 17'' x 11''rectangle aprox. This will be quite thin. Dust the dough and work surface with flour when necessary. Brush the rolled out dough with the butter. Sprinkle the cinnamon and sugar mixture evenly over the surface. Use your fingers to spread it if needed. Start from the opposite end of the dough, roll the dough neatly in a line towards you. Roll as tightly as possible. I again do a clumsy job here. Dust fingers with flour if the dough feels sticky. Pinch the seams to seal. Using a sharp knife or bench scraper (a bench scraper works really well for this), cut into1 inch thick slices and arrange in your pan(s). Place them spaced apart. Cover with a greased aluminum foil (not that they will rise vertically, but if the foil touches the dough, you want to be safe), let the the rolls double in size. This again took about 50 minutes. Preheat oven to 180 degrees C / 350 degree F towards the end of the rise time. Bake for 20 -25 minutes until golden brown or till the temperature on your instant read thermometer reads 200F. Don't forget to watch them as they really swell as they bake!! The rolls in my OTG were done in 25 minutes, whereas the ones in the microwave took about 5-8 minutes longer. Brush the rolls with melted butter for a softer crust. Cool in the pan for 5 minutes, then completely on the rack. The rolls from the OTG were really soft, those from the microwave a bit less softer, but both tasted delicious. Be sure you know your yeast! Watch my video here ! If you do not like cinnamon, try using cardamom instead. Or some grated orange zest in the dough, grated dark chocolate in the filling. Or a coconut and cardamom filling. Or just vanilla and chocolate. I shall be baking these again and post any updates. How to know if your yeast is good. Please follow my page on Facebook for updates on new videos for beginners in baking, every Monday! Click here to subscribe to my You Tube Channel. Click to subscribe now! Ahem.. let me start this post with a disclaimer - (never thought will begin a post like this!). I am not really qualified to write this kind of a post being relatively new to bread baking. Am just compiling my observations and doubts which I had as a beginner and a few things I learnt during the process of bread baking, so please correct me if I am wrong. I am still very much learning my way with breads, have a small folder of not-so-successful ones, truth be told. But I am definitely better than where I started . Am now much more confident with yeast and in love with baking breads to the point of being obsessed. Now prefer home-made breads to the store-made ones. Its been an eventful journey from distressed baking-bread-is-not-my-thing to I-just -can't-wait-to-get-my-bread-machine. Baking, for me earlier, unbelievably revolved around cakes. Thanks to blogging, it opened up a whole new world of baking to me. Something made me give baking bread a try. And how hard I tried and tried. And cried and cried, buckets no less - on Champa's shoulder. She actually had to replace the keypad of her lap-top drenched with my tears! :)). A lot of credit goes to her, she is a baking doctor in disguise of a software engineer, let me tell you! I can't write this post without mentioning her here, thanks a zillion times over Champa! You are an inspiration to me and a lot of others too. Moving ahead, am sharing a few things which may be of help if you have not baked bread yet or just have started baking bread. I shall try to update pictures here as and when possible - I have a chaotic, umm, style of working in the kitchen you see, so not best suited for in-the-process pictures. Caution : Continue reading only if you are really interested in baking breads or you may doze off by the time you are through with this lengthy post! Information complied from Champa's blog (not to mention the umpteen mails exchanged between us) and The King Arthur Whole Grain Baking Book. Bread Baking Process In a nutshell: To bake bread, the dough ingredients are mixed, kneaded (sometimes not) , allowed to rise once, then deflated, shaped, allowed to rise again in the pan and then baked. This is a process which could take anywhere between 3 to 4 hours or more depending on the recipe and other factors. Dough Ingredients: Typically flour, yeast, sugar, salt, fat and liquid and optional flavorings. Good Yeast : This is the biggest and most critical factor, even if all else is just perfect and the yeast isn't, a good loaf is impossible. Please refer my earlier post on this for more details. Accurate measurements: As with all baking, breads specially and absolutely need accurately measured ingredients. So we can't really toss in a bit more of this and that when we are beginning. We can't eyeball the amount of liquid that goes into the bread unless you are an expert. Measure. Weigh ingredients for best results. Get digital kitchen scales if serious about baking. While reading a recipe, check how the flour has been measured, people use different measuring methods. It could be dip cup into the flour and level (referred to as dip and sweep method) method or spoon flour into the cup and level method. I measure by spooning the flour lightly into the cup and leveling it with a spatula. My one cup of APF measured this way weighs 130 grams. Mise en place: Measure and have all your ingredients ready before you begin. You do not want to run around like a headless chicken for a missing ingredient while the yeast proofs. If you leave the yeast for too long at this stage, even good yeast may lose its potency. If you are going to be adding something cooked or hot to the dough, eg, sauteed onion, make it first, so that it cools completely before you begin proofing the yeast. If you add this hot thing to the dough, you may kill the yeast. And yes, killing yeast is a huge crime in the books of a bread baker. Serious! Salt in breads : Salt is a must in all breads, including sweet breads. If you do not use salt, the bread will taste flat. So you can't skip salt in any bread recipe. Sugar in breads : This is a must when you use Active dried yeast, but not really indispensable when you use instant yeast. The instant yeast uses the sugar in the flour and starts growing. So some recipes (using instant yeast) may not have sugar at all. Dough with more sugar in it will color more. Dough without sugar will give lighter colored bread. Adding milk to a dough as part of the liquid helps the bread get a nice color. Fat: Oil, butter, egg yolks, cheese that go into the dough. Fat gives the loaf a tender crumb. Bread without fat will be chewy, example a Baguette. Spices in breads: One of the best things about home-baked breads is you can add herbs and flavorings to your taste and preference. But be careful as you add cinnamon and garlic (not as a combination of course!) Yeast slows down with too much of these. Up to 2 1/2 teaspoons of ground cinnamon for 3 cups of flour is fine. 6 medium cloves of garlic for 3 cups of flour. Source KAF Whole Grain Baking Book. Liquid - flour ratio : This plays one of the key roles in a successful bread. Be careful to not skew this ratio when you mix the dough. Milk, yogurt, buttermilk, water, juice, honey, whipping cream, coconut milk, beer, eggs, butter, oil etc form the liquid portions of a bread dough. Be particularly careful when you are working with whole wheat flour as different kinds of whole wheat flour take different amounts of water. Unless you are using the same brand and kind of flour and the same method of measuring flour, under the same weather conditions, the liquid amount may not be the same. So how do you gauge the amount of liquid that goes in here? When you read a recipe, pay attention to the consistency of the dough stated in it. The dough may be soft and smooth, sticky or very sticky or sometimes tacky. A tacky dough is one which sticks to your hand, but peels off easily as well. Go by this consistency as your guide. When in doubt, do not add the entire liquid in the beginning, save, say about 1/4 cup of it, add it gradually, tablespoon by tablespoon and then by teaspoons till you reach the desired dough consistency. Note down how much you have used. In case your bread doesn't turn out perfect, refer this and adjust accordingly the next time you bake. If a recipe does not have onion in it and you add it, it will contribute to the liquid in the recipe, so you will need to reduce the liquid accordingly. Same with fresh fruit. So avoid adding these (unless you know what you are doing) if you are tweaking a recipe. Liquid absorption in the dough: The KAF book says, flour is like sponge. It absorbs moisture from the air when it is humid. So when the weather is humid, it will take less liquid. So start with lesser liquid when it is humid. Flour range - Most recipes will specify a range of flour - as in - 3 to 3 1/4 cups flour. Start with the lower range. The range is given as you may need different amounts of flour due to atmospheric conditions and way of measuring the flour. Again add the flour keeping in mind the consistency of the dough the recipe calls for. Dough consistency: When you read a recipe, pay attention to the consistency of the dough (if mentioned in the recipe). For example, soft dough, sticky dough or tacky dough. A tacky dough is a dough which sticks to your hands slightly but also easily peels off your hands. Aim to get the dough to the specified consistency within the specified range of flour and liquid. There again may be a variation of a tablespoon or two which should be fine. Kneading the dough: You could knead the bread with your hands or in a bread machine ( A very heavy, jealousy rr..eeking sigh here!) sometimes a food processor or electric mixer. Contrary to what we have heard or seen, bashing the bread dough does not help. Treat your dough gently. Knead but do not fling it down on your counter-top. Too much of rough handling the dough may kill the yeast. Too much of kneading does not help either. Time your kneading, do not approximate. I try to flour very lightly or not to flour the counter at all while kneading, I sometimes oil it. Proofing the dough : Once your dough is kneaded keep it an oiled bowl. Turn it once, so that the dough has a coat of oil all around. We need to know the level of the dough so that we can gauge if it has doubled. I wish to have one of those dough rising buckets with markings which make it easier. Since I don't, I push a scale carefully beside the dough and read the level, mark (with a dab of flour). Mark the level where it needs to reach to double. Keep the bowl covered with a clean kitchen towel. Keep it in a warm place, e.g, inside your microwave (turned off of course). Its OK to open the towel and see if the dough has doubled. Normally it takes about 40 minutes to an hour. Check around 30 minutes.If the dough doubles sooner than this, in all probabilities you have used more yeast or more liquid. More yeast may give a quicker bread, but will smell funny. More liquid will not give you a good loaf. Proofing Time: Recipes specify a time range for the bread dough to rise (proof). This is merely an approximate indication. The actual time proofing time depends on the weather, the kneading technique and warmth of the rising place. Breads kneaded in a bread machine supposedly rise faster. So again pay attention to what the dough is supposed to look like after the specified time - doubled, puffy or almost doubled. So if your recipe says - rest the dough for an hour or till doubled in volume, and your dough doubles in 40 minutes, you can safely carry on with the rest of the procedure. If the dough needs to double, let it just double. Not more than that. I was of the assumption that if it rises even more, the better. Post a certain stage of rising, the bread will not have enough support in the pan and will collapse, giving a mushroom shape to the bread and sometimes a denser bread. Be specially careful in a no-knead bread as the dough is quite wet and will need the support of the tin even more. If the no-knead dough has to rise up to the rim of the pan /muffin cup during the second rise, let it rise up to that point itself. Breads with eggs rise higher than those without eggs. First rise: When we mix ingredients, knead and keep the dough for rising, this is called as the first rise. Second or Final Rise: After the dough rises, it is deflated, shaped and placed in the pan or tin and allowed to rise again. This is the second rise. 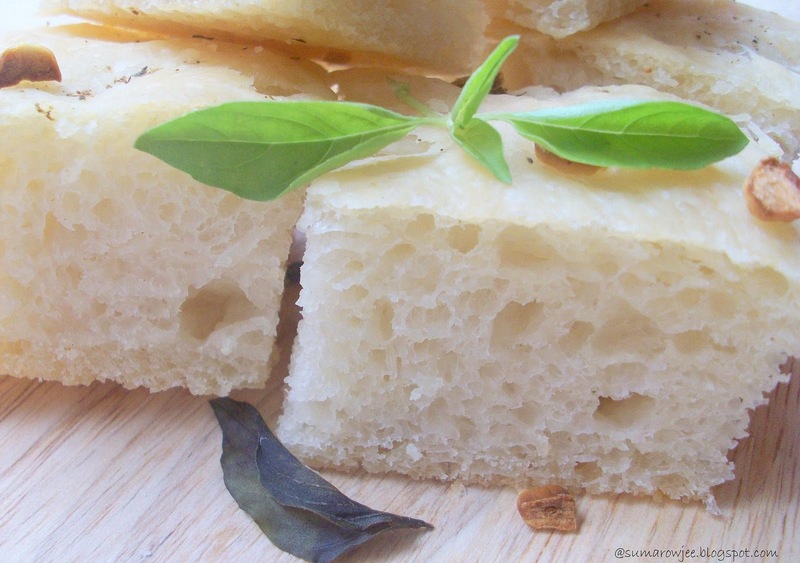 Some breads will be allowed to rise only once and baked.This quick Focaccia for example. Shaping the bread : After the first rise, deflate the dough gently. Roll it into a rectangle according to the size of your pan. Roll up (like a Swiss roll) starting with the narrow edge. Seal with your fingertips as you roll. Seal the final edge of the dough. Seal the two ends of the roll by pressing down to make a thin sealed strip at each end. Fold the sealed strips under the loaf and place in the pan. - As described in the Better Homes And Gardens Homemade Bread Book. During the Second rise: When you shape the proofed bread dough and place it in the tin to rise again, this is called the second rise. This time around cover the pan with a greased aluminum foil. Keep in warm place (unless otherwise specified in the recipe). If you use a towel or something like that, it will stick to the risen dough and then you will need to peel it off, with tears in your eyes, deflating the dough. Assuming you leave the dough to proof for longer during the second rise and it rises way more than indicated, you can punch it down again, re-shape and again let it rise to the level needed. This time, no excuses, other than the dreaded no-power! When baking 100% whole wheat breads , the dough may not always double. So the test here to move towards shaping and baking after the first rise and second rise is - when you lightly press two fingertips quickly 1/2 inch into the dough and the indentation remains. - Source - Better Homes And Gardens, Homemade Bread Book. Baking : Don't forget to pre-heat your oven (if using an OTG) atleast 20 minutes before the end of the rising period. Better have a hot oven ready and waiting than keep the dough waiting till the oven heats up. I have a few times forgotten to do this (the result of using both the Microwave and an OTG for baking, the microwave takes 5 minutes to pre-heat), ended up with a dough which waited longer than needed and resulted in perfectly -edible- but- not- great- breads. Some breads like some focaccias and pizzas are baked at high temperatures. I normally bake at 190 degrees C for the first 15-20 minutes and then at 160 C degrees - just following the teacher :)). This is to ensure that the bread gets a good color initially at the higher temp and then baked well from within later. If your bread browns at 15-20 minutes, its a good sign, the liquid-flour ratio is right! Also, dough with more sugar colors more, dough with less sugar may not brown a lot. Dough with milk gets a better color. Breads with egg-wash color beautifully, specially sweet breads. When is a bread done? The bread is baked when at the end of the baking time, the bread turns a golden brown and the loaf sounds hollow when tapped on the bottom. If its not done, put it back immediately in the oven and bake for some more time. If you bake it again long after its come out of the oven, it will not help as the yeast will be long dead by then. Instant read thermometer: My now indispensable tool for testing the done-ness of bread. The temperature should read between 200 - 210 F on this and your bread is done. 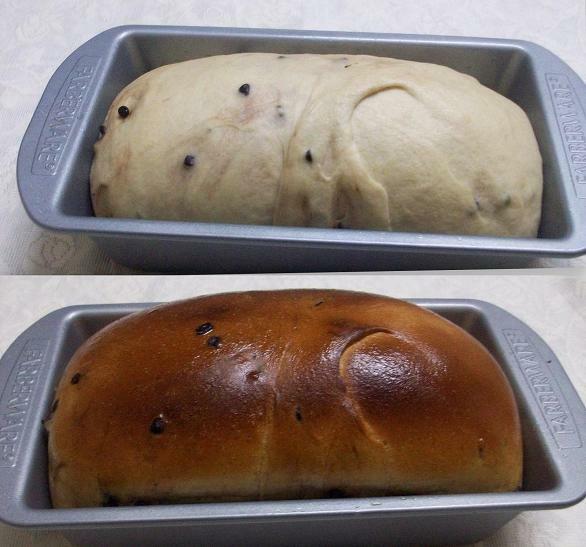 After baking : Once out of the oven, brushing the top of the loaf at this stage with melted butter will make it soft .Allow the bread to cool in the tin for 10 minutes, then take it out and cool on the rack completely. . Though its very tempting, do not slice it when warm as it will still be cooking. Also when the steam from the warm bread escapes when sliced, the bread tends to stale or dry out faster later. It will not remain moist. So when the bread is cooling, may I suggest that you clean the counter or set up the props for your pictures? Noting down: Note down the weight of flour, quantity of liquid that goes in a recipe. Note down the time at which you keep the dough for the first rise, the second rise. We don't want to forget at what time you kept it for the rise when we are learning. Though this will not be exactly the same for even the same recipe always, this will help approximate the rising time. Picking a recipe for a beginner : Chose a recipe from a reliable source which gives you accurate measurements in terms of the flour and liquid. If you have just begun or yet to start, start with a no-knead recipe. Kneading forms an important part of the bread baking process and adequate / inadequate kneading can make a good or not-so-good bread. This being the case, a no-knead bread gives you better chances at success. Needless to say, this is highly motivating for the new bread baker. Pick up a recipe with only APF in the beginning. You can then move on to a combination of both and then only whole wheat, multi grain etc. Start with no-knead recipes and then move on to the ones which require kneading. Bake bread at home and you will really gift a lot of satisfaction and joy - to yourself and your family. You just read how a dummy baked bread, if I can do it, so can you! Here are some easy breads you could try. This is also my entry to Jaya's event Back To Basics, hosted by Padmajha this month, the theme is Basic Breads . This being the contingent truth, some of us favor cocoa and some of us chocolate. I belong to the latter category. I adore chocolate and all things baked with it. Bakes with melted chocolate get me to the kitchen faster than those with cocoa .Give me a recipe which has both and I will have one foot in the kitchen even before I bookmark it . Though I like cocoa and make sure I have some in the fridge at all times, my loyalties lie towards chocolate. A box of chopped dark chocolate is a must in my kitchen for all those times when I have to bake something chocolate and fast .So when I come across recipes which have both the words 'best' and 'cocoa' in them, I am tempted to try. Will this make a convert of me? Having discovered my love for dense, fudgy brownies (cakey brownies are just not my thing, well, cakey brownies are CAKES, why call them brownies??!! 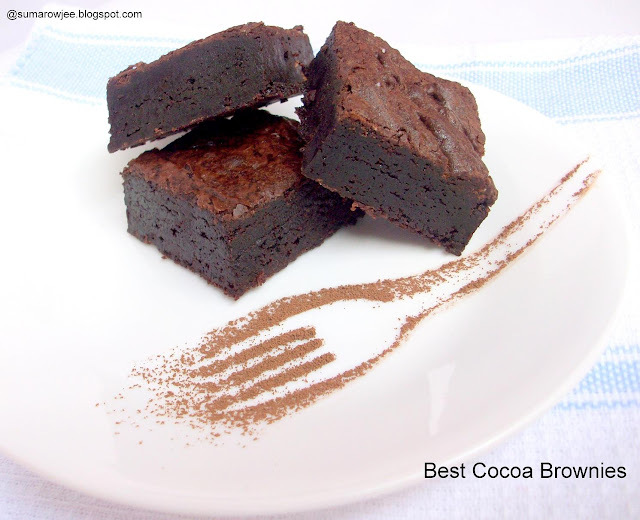 ), I succumb to the temptation to bake some Best Cocoa Brownies. Little room for doubt when the recipe is by Alice Medrich and baked by one of my fav bloggers, Deb( who else?) of Smitten Kitchen. Reading her post, I nod my head as I am certainly one of those folks who sincerely believe that 'all roads to fudgy, dark and rich brownies must be paved with bricks of tempered chocolate' Count me in please! But then she says, this brownie will make these folks eat humble pie...oh sorry, brownie and then make converts out of them - from 'Only chocolate for me' to ' Wow Cocoa, you have me sold!' or something to that effect. 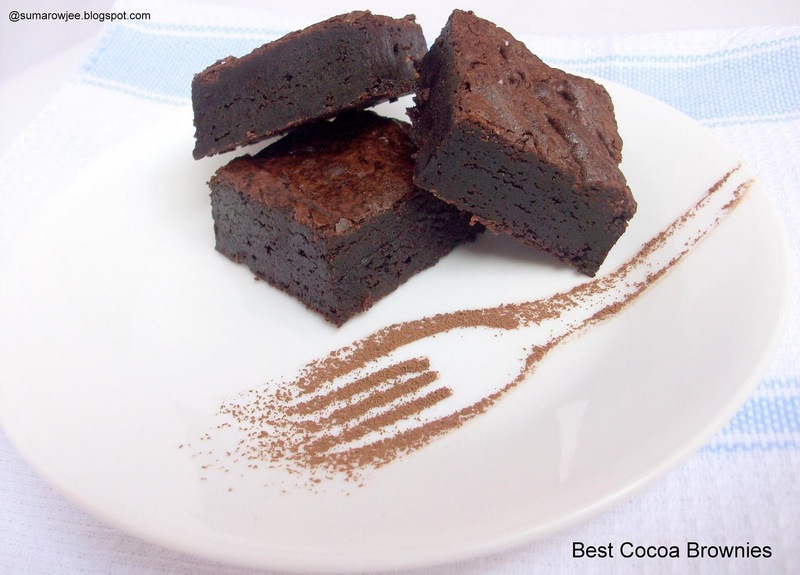 These brownies are rich, fudgy, very chocolaty and truly good. Procedure : Preheat the oven to 160 degrees C / 325°F . Line the bottom and sides of an 8×8-inch square baking pan with parchment paper or foil, leaving an overhang on two opposite sides. Combine the butter, sugar, cocoa, and salt (if using) in a medium sized microwave safe bowl and microwave on HIGH power for one minute, then 30 seconds each time, stirring in between ( Or place all of these in a heatproof bowl and set the bowl in a wide skillet of barely simmering water) Stir from time to time until the butter is melted and the mixture is smooth and hot enough that you want to remove your finger fairly quickly after dipping it in to test. Remove the bowl from the skillet or microwave and set aside briefly until the mixture is only warm, not hot. It looks fairly gritty at this point, but don’t fret says Deb — it should smoothen out once the eggs and flour are added. Note: Mine was not completely smooth even after adding the eggs and flour. See the picture above. Stir in the vanilla with a wooden spoon. Add the eggs one at a time, stirring vigorously after each one. When the batter looks thick, shiny, and well blended, add the flour and stir until you cannot see it any longer, then beat vigorously for 40 strokes with a wooden spoon or a rubber spatula. I used a wooden spoon. This is some amount of effort as the batter will be quite thick, don't tell me I did not warn you! Stir in the nuts, if using. Spread evenly in the lined pan. Bake until a toothpick plunged into the center emerges slightly moist with batter, mine took about 40 minutes. As Alice suggests 20-25 minutes, safer to check at 20 minutes, bake longer if needed. Let cool completely on a rack. I left my pan on the rack for quite some time, then left it in the fridge, covered with clingfilm overnight. I was determined to get cleaner cuts this time, kids away helped! 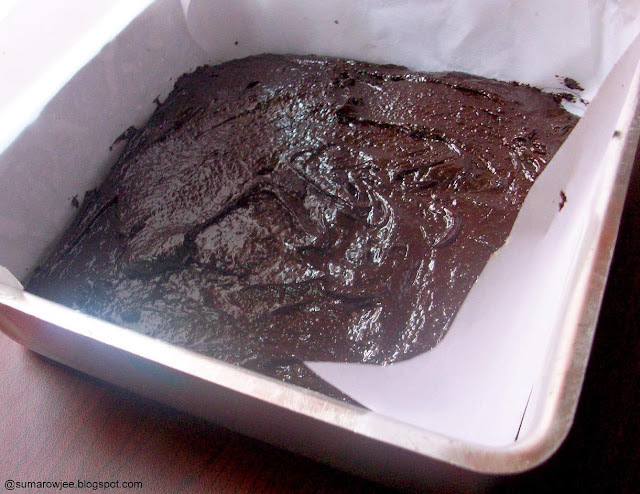 Lift up the ends of the parchment or foil liner, and transfer the brownies to a cutting board. Cut into 16 or 25 squares. These are quite rich, my suggestion - make it 25 pieces. Note : I am not sure if the mixture not being completely smooth (like Deb's) even after the addition of eggs and flour was in any way critical to the texture of the brownies. I was happy with mine. The top was not shiny either. I will next time use superfine sugar and see if there will be any notable difference. Eggs : The eggs we get here weigh about 48 grams without shells which is the weight of large eggs without shells. 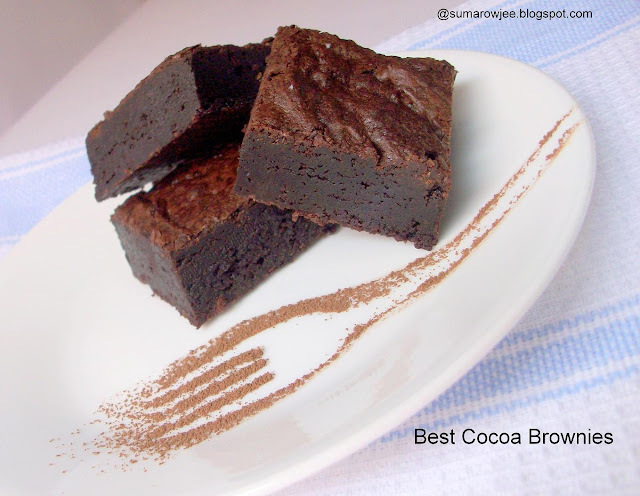 How we liked them : The Best Cocoa Brownies earned some brownie points in the eyes of a die-hard chocolate lover! To be baked again for sure!